We recommend printing a copy of this page for your reference. We also recommend referring back to this document regularly, as we may make changes and post them to this site. Access to or use of the site after the posting of such changes will be deemed consent to such changes. APIC has the right at any time to change or discontinue any aspect or feature of the site, including, without limitation, the content, hours of availability, and equipment needed for access or use of the site. Use of this site is solely at APIC’s discretion, and APIC reserves the right to prohibit anyone from accessing, browsing, supplying information to, downloading information from, or conducting business on this site. The Information may be supplied by APIC or third parties and users of the site. Any opinions, advice, statements, or other information or content expressed or made available by third parties are those of the respective author(s) or distributor(s) and not of APIC. In many instances, the content available through the site represents the opinions and judgments of the respective information provider or user. APIC neither endorses nor is responsible for the accuracy or reliability of any opinion, advice or statement made on the site by anyone other than authorized APIC spokespersons acting in their official capacities. THIS SITE IS NOT DESIGNED TO, AND DOES NOT, PROVIDE MEDICAL ADVICE. All Information is for general informational purposes only. The Information is not intended to be a substitute for professional medical advice, diagnosis or treatment. This site and its services do not constitute the practice of any medical, nursing or other professional health care advice, diagnosis or treatment. NEVER DISREGARD PROFESSIONAL MEDICAL ADVICE, OR DELAY IN SEEKING IT, BECAUSE OF SOMETHING YOU HAVE READ ON THIS SITE. NEVER RELY ON INFORMATION ON THIS SITE IN PLACE OF SEEKING PROFESSIONAL MEDICAL ADVICE. APIC advises users to always seek the advice of a physician or other qualified health care provider with any questions regarding personal health or medical conditions. Never disregard, avoid or delay in obtaining medical advice from your doctor or other qualified health care provider because of something you have read on this site. If you have or suspect that you have a medical problem or condition, please contact a qualified health care professional immediately. If you are in the United States and are experiencing a medical emergency, please dial 911 or call for emergency medical help on the nearest telephone. 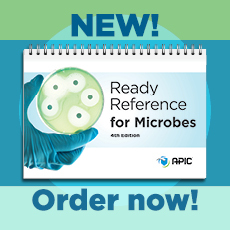 APIC does not recommend or endorse any specific tests, products, procedures, opinions, physicians, clinics, or other information that may be mentioned or referenced on this site. The advertisers who purchase banners or otherwise sponsor or support APIC and this site have no influence on the editorial content or presentation, and the posting of advertisements is not to be taken as an implied or express endorsement of any such product or service. You agree (i) to comply with all applicable laws and regulations regarding your use of this site and the Information, (ii) not to retransmit, publicly display, sell or use the Information provided other than solely for your internal business purposes, (iii) not to alter or remove any of the Information or any consent or other proprietary notice or legend on any of the Information, (iv) not to post or transmit through the site any material that violates or infringes in any way upon the rights of others, which is unlawful, threatening, abusive, defamatory, invasive of privacy or publicity rights, vulgar, obscene, profane or otherwise objectionable, which encourages conduct that would constitute a criminal offense, gives rise to civil liability or otherwise violate any law, (v) not to post or transmit through the site any material which contains advertising or any solicitation with respect to products or services without APIC’s express prior approval, and (vi) not to use the site to advertise or perform any commercial solicitation. Any conduct by you that in APIC’s discretion restricts or inhibits any other user from using or enjoying the site will not be permitted. While it may monitor, remove or delete transmissions to this site, APIC is under no obligation to monitor, remove or delete any transmissions. APIC exercises no editorial review and assumes no responsibility for misleading, fraudulent, defamatory, libelous, threatening, harassing, pornographic, obscene or illegal Information supplied to this site; provided, however, that APIC may take any action with respect to any Information that APIC deems in its sole discretion is necessary or appropriate, including the deletion of any such Information. You agree to promptly report any suspicious or unauthorized use of this site to APIC. APIC reserves the right to monitor any and all activity on this site and APIC may notify the proper law enforcement officials if any suspicious activity is detected. This site may provide links to other Internet sites. Such links are provided as a service to users and are not sponsored by, endorsed or otherwise affiliated with this site or with the products and services of APIC. APIC is not responsible for the availability of such other sites and is not responsible or liable for any content, products or other materials available on such other sites. Further, APIC reserves the right to terminate any link at any time. APIC does not author, edit, or monitor these unofficial pages or links. You acknowledge and agree that APIC shall not be responsible or liable, directly or indirectly, for any damage or loss caused or alleged to be caused by or in connection with the use of or reliance on any information, goods or services available on or through any such site. If you decide to access any of the third party sites linked to this site, you do this entirely at your own risk. YOUR USE OF THIS SITE OR ANY OF THE INFORMATION IS AT YOUR OWN RISK. THIS SITE AND THE INFORMATION ARE PROVIDED “AS-IS” AND “AS-AVAILABLE.” THAT MEANS THAT THE INFORMATION CONTAINED ON OR PROVIDED THROUGH THIS SERVICE IS INTENDED FOR GENERAL CONSUMER UNDERSTANDING AND EDUCATION. ANY ACCESS TO THIS SITE IS VOLUNTARY. WE WILL REGARD ALL ACCESS AS VOLUNTARY AND AT THE SOLE RISK OF THE USER. APIC IS NOT RESPONSIBLE OR LIABLE FOR ANY ADVICE, COURSE OF TREATMENT, DIAGNOSIS OR ANY OTHER INFORMATION, SERVICES OR PRODUCTS THAT YOU OBTAIN THROUGH THIS SITE OR FROM YOUR PHYSICIAN WHO MAY ACCESS INFORMATION OR SERVICES THROUGH THIS SITE. APIC HEREBY DISCLAIMS ANY AND ALL WARRANTIES WITH RESPECT TO THE SITE AND THE INFORMATION, WHETHER EXPRESS OR IMPLIED, INCLUDING WITHOUT LIMITATION, ANY CLAIMS RELATING TO ALLEGATIONS OF PERSONAL INJURY, WRONGFUL DEATH, WARRANTY OF MERCHANTABILITY, SATISFACTION, FITNESS FOR PARTICULAR PURPOSE, COMPLETENESS, ACCURACY, RELIABILITY, QUALITY, TIMELINESS, UNINTERRUPTED USE, TITLE AND NON-INFRINGEMENT. SOME JURISDICTIONS DO NOT ALLOW THE DISCLAIMER OF IMPLIED WARRANTIES, SO THE FOREGOING DISCLAIMER MAY NOT APPLY TO YOU. YOU MAY ALSO HAVE OTHER LEGAL RIGHTS THAT MAY VARY BY JURISDICTION. APIC MAKES NO REPRESENTATIONS OR WARRANTIES ABOUT THE SATISFACTION OF GOVERNMENT REGULATIONS REQUIRING DISCLOSURE OF INFORMATION ON PRESCRIPTION DRUG PRODUCTS WITH REGARD TO THE CONTENT CONTAINED ON THIS WEB SITE OR THE PRODUCTS OR SERVICES SOLD OR ADVERTISED HEREIN. YOU HAVE THE SOLE RESPONSIBILITY FOR VERIFYING THE COMPLETENESS, ACCURACY, RELIABILITY, QUALITY AND TIMELINESS OF ALL INFORMATION AND SERVICES MADE AVAILABLE ON THIS SITE. APIC MAKES NO REPRESENTATIONS OR WARRANTIES WITH RESPECT THE INFORMATION, SERVICES OR MATERIALS MADE AVAILABLE BY ITS BUSINESS ASSOCIATES OR ITS CUSTOMERS. APIC MAKES NO REPRESENTATION OR WARRANTY THAT USING THIS SITE, ANY OF THE SERVICES OR THE INFORMATION WILL BE UNINTERRUPTED OR ERROR FREE. APIC IS NOT RESPONSIBLE FOR THE CONTENT OF ANY WEB SITES LINKED TO THIS SITE. LINKING TO OTHER WEB SITES FROM THIS SITE IS AT YOUR OWN RISK. YOU HEREBY IRREVOCABLY RELEASE APIC FROM ANY AND ALL LIABILITY FOR ANY DAMAGE, LOSS, LIABILITY OR EXPENSE THAT YOU MAY SUFFER OR INCUR AS A RESULT OF OR ARISING FROM YOUR USE OF THIS SITE OR THE INFORMATION. UNDER NO CIRCUMSTANCES WILL APIC BE LIABLE FOR ANY DAMAGES OF ANY KIND, INCLUDING WITHOUT LIMITATION ANY DIRECT, INDIRECT, CONSEQUENTIAL, SPECIAL, PUNITIVE OR INCIDENTAL DAMAGES, WHETHER FORESEEABLE OR UNFORESEEABLE, BASED ON YOUR CLAIMS OR THE CLAIMS OF YOUR CUSTOMERS (INCLUDING, BUT NOT LIMITED TO, CLAIMS FOR LOSS OF DATA, GOODWILL, PROFITS, USE OF MONEY, INTERRUPTION IN USE OR AVAILABILITY OF THE SITE, THE SERVICES OR THE INFORMATION, STOPPAGE OF OTHER WORK OR IMPLEMENTATION OF OTHER ASSETS), ARISING OUT OF YOUR USE OF THE SITE, ANY SERVICE OR ANY INFORMATION, BREACH OR FAILURE OF EXPRESS OR IMPLIED WARRANTY, BREACH OF CONTRACT, MISREPRESENTATION, NEGLIGENCE, STRICT LIABILITY IN TORT OR OTHERWISE. AS ANY ALLEGATION OF DAMAGES WOULD BE DIFFICULT IF NOT IMPOSSIBLE TO DETERMINE YOU AGREE THAT THE TOTAL LIABILITY OF APIC FOR ACTUAL DAMAGES SHALL NOT EXCEED THE TOTAL AMOUNTS PAID BY YOU TO APIC DURING THE TWELVE MONTHS PRECEDING THE EVENT GIVING RISE TO SUCH ALLEGATIONS OF LIABILITY, OR IF NO AMOUNTS HAVE BEEN PAID BY YOU, ONE HUNDRED DOLLARS ($100). ANY CLAIMS ARISING IN CONNECTION WITH YOUR USE OF THE SITE OR ANY INFORMATION MUST BE BROUGHT WITHIN ONE (1) YEAR OF THE DATE OF THE EVENT GIVING RISE TO SUCH ACTION OCCURRED. REMEDIES UNDER THESE TERMS AND CONDITIONS ARE EXCLUSIVE AND ARE LIMITED TO THOSE EXPRESSLY PROVIDED FOR IN THESE TERMS AND CONDITIONS. You agree to defend, indemnify and hold APIC harmless from and against any damage, loss, liability or expense (including reasonable attorney’s fee) that APIC may suffer or incur as a result of any claim attributable to or based upon your use of this site or any of the Information. If for any reason you are not satisfied with this site or the Information, your sole remedy is to cease using this site or the Information. Nothing in these terms and conditions will be construed to make APIC or its business associates, customers or you an agent, employee, joint venture, partner, franchisee-franchisor or legal representative of any of the others. None of us will either have or represent itself to have any authority to bind another to any obligation. If any provision of these terms and conditions is held to be unenforceable, this holding will not affect the validity of the other provisions. APIC controls and operates this site from our offices in Washington, D.C. These terms and conditions, and your use of the site, will be governed by and interpreted in accordance with the laws of the District of Columbia, U.S.A, excluding its conflicts-of-law rules. Any controversy or dispute will be submitted to the state or federal courts in and for the District of Columbia. You hereby consent to the personal jurisdiction of the District of Columbia, acknowledge that venue is proper in any local or Federal court in the District of Columbia, and waive any objection that may exist, now or in the future, with respect to any of the foregoing. APIC makes no claims that the Information is appropriate or may be downloaded outside of the United States. Access to the Information may not be legal by certain persons or in certain countries. If you access the APIC content and services from outside the United States, you do so at your own risk and are responsible for compliance with the laws of your jurisdiction. These terms and conditions constitute the complete and exclusive statement of the terms, conditions and representations of the agreement between us with respect to this site and the Information and supersedes all other agreements with respect to the subject matter hereof. APIC may change these terms and conditions from time to time and at any time, without actual notice to you. In the event of a change, APIC will post the revised version to our web site. Any access to or use of the site after such an update will be deemed consent to such update. You are therefore encouraged to refer back to this page regularly. These terms and conditions may not be otherwise amended without the written consent of APIC. The foregoing provisions are for the benefit of APIC, its subsidiaries, affiliates and its third party content providers and licensors and each shall have the right to assert and enforce such provisions directly or on its own behalf. Copyright © 2005, Association for Professionals in Infection Control and Epidemiology, Inc. All rights reserved. Some portions of this site are used under license. 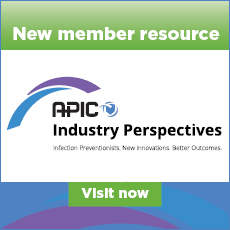 APIC is a trademark of the Association for Professionals in Infection Control and Epidemiology, Inc. All other brands and product names are trademarks or registered trademarks of their respective owners.